Play hard, but be sure to play it safe! We know you can't wait to hear the rolling waves and feel the soft sand between your toes - but before you hit the beaches of the Outer Banks, please review the following ocean safety guidelines. We want you to have a wonderful time on the gorgeous Outer Banks seashore, but more importantly, we want you and your family to be safe. Carefully watch children at all times. Never enter the water when red "No Swimming" flags are flying. It is always best to swim in front of a lifeguard station. Always feel free to ask the lifeguard about water conditions and safety risks. Stay 300 feet away from fishing piers. Avoid swimming near anglers casting their lines. Don't turn your back on the waves - watch what is coming. Rip currents are narrow channels of fast moving water flowing away from shore. This happens when there is a break in a sandbar near the shore or when the current is offshore. Rip currents can reach up to 100 feet in width and travel up to 3 mph! Some are present for only a few hours, but others are permanent. Rip currents are more prevalent after storms and account for more than 80% of lifeguard beach rescues. If you are caught in a rip current, do not try to swim against it. Even the best swimmers can tire out trying to fight against a rip current. Stay calm and swim parallel to shore until you are out of the current. Rip currents are rarely more than 30 feet wide. If you can't break out of the current, float calmly until it dissipates, usually just beyond the breakers. Then, swim diagonally to shore. The worst thing you can do is panic or struggle. 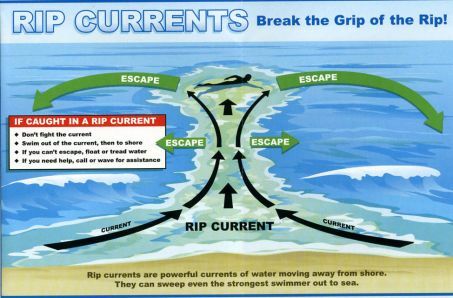 Learn about rip current safety before your Outer Banks vacation. A difference in the waves - larger, choppier waves in the rip current and smaller, calmer waves in front of the sandbar. NOTE: Polarized sunglasses cut glare and can help to spot rip currents. Rip Tide Safety Tips are provided courtesy of North Carolina Sea Grant. For more information on Rip Currents please visit the NOAA Rip Current Safety site. Jellyfish ar e brought to shallow water or ashore by the currents or wind. Jellyfish can be difficult to spot due to their see-through bodies. It's important to note that you can be stung by a jellyfish that has been washed to shore. 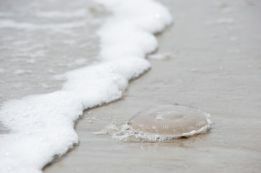 As you're walking along the beach, keep a lookout for jellyfish camouflaged in the sand. Fortunately, most jellyfish stings aren't serious. Typical reactions include red welts, stinging, and itching. If you are stung by a jellyfish, 1) wash the area with salt water, 2) apply white vinegar to neutralize the venom, and 3) take an over-the-counter pain reliever. If you experience difficultly in breathing, chest pain, or any other serious symptoms, seek medical treatment immediately. The Outer Banks offers highly qualified and skilled lifeguards. Some areas of the Outer Banks have fixed lifeguard stands, while others only offer roving patrols. It is always safest to swim near a fixed lifeguard station - particularly if you have children. 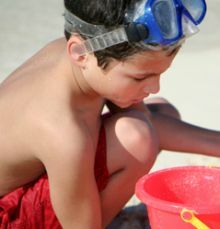 Lifeguards are generally on duty between Memorial Day and Labor Day weekend. Please note that hours and lifeguard locations are subject to change without notice.